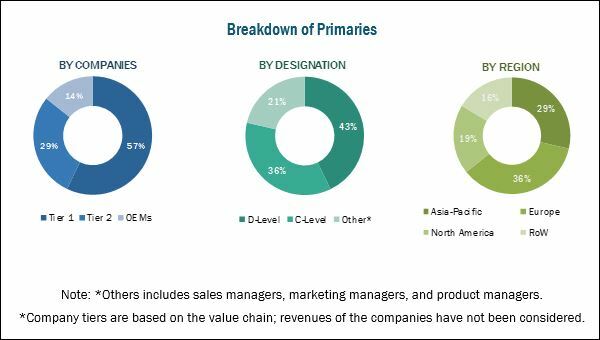 [161 Pages Report] The Automotive ECU Market (Electronic Control Unit) was valued at USD 23.55 billion in 2017 and is projected to reach USD 39.28 billion by 2025, at a CAGR of 5.77% during the forecast period. The base year for the report is 2017 and the forecast period is 2018 to 2025. The research methodology used in the report involves primary and secondary sources and follows a bottom-up approach for the purpose of data triangulation. The study involves the country-level OEM and model-wise analysis of automotive ECU market. This analysis involves historical trends as well as existing market penetrations by country as well as vehicle type. The analysis is projected based on various factors such as growth trends in vehicle production and adoption rate by OEMs. The analysis has been discussed with and validated by primary respondents, which include experts from the automotive industry, manufacturers, and suppliers. Secondary sources include associations such as China Association of Automobile Manufacturers (CAAM), International Organization of Motor Vehicle Manufacturers (OICA), European Automobile Manufacturers Association (ACEA), Environmental Protection Agency (EPA), Society of Indian Automotive Manufacturers, SAE International, and paid databases and directories such as Factiva. The ecosystem of the ECU market for automotive consists of automotive ECU manufacturers such as Continental (Germany), Bosch (Germany), Aptiv (UK), Denso (Japan), Autoliv (Sweden), Mitsubishi Electric (Japan), ZF (Germany), Hitachi (Japan), and Magneti Marelli (Italy). The automotive ECUs are supplied to the Tier 1 companies manufacturing electronic systems and automotive OEMs. The Automotive ECU Market (Electronic Control Unit) is projected to grow at a CAGR of 5.77% from 2018 to 2025. The market for automotive ECUs is estimated to be USD 25.08 billion in 2018 and is projected to reach USD 39.28 billion by 2025. The key growth drivers of this market are the increased incorporation of advanced safety, convenience, and comfort systems in vehicles and the increase in demand for hybrid electric vehicles (HEV) and battery electric vehicles (BEV). The ADAS & safety system segment is estimated to hold the largest market share in the global automotive ECU market. The market growth in this segment can be attributed to the increasing number of government mandates for ADAS features and the inclusion of basic safety systems such as ABS, airbags, and TPMS. The 64-bit ECU is estimated to be the fastest growing segment of automotive ECU market. Rising demand for advanced electronics such as windshield HUDs, camera modules, drive mode selector, RADAR, LiDAR, and advanced telematics that require fast and real-time processing is expected to drive the 64-bit ECU market. By vehicle type, the light-duty vehicles segment is estimated to hold the largest market share of the automotive ECU market. Luxury light-duty vehicles use a large number of ECUs as these vehicles are equipped with advanced vehicle electronics functions for better comfort, convenience, and safety. Additionally, factors such as the sizeable number of luxury light-duty vehicles in Europe and North America and the increasing demand for these vehicles in the Asia Pacific region are increasing the demand for automotive ECUs. In the Asia Pacific region, the demand for luxury light-duty vehicles is growing due to the increasing purchasing power of consumers and the growing demand for comfort and safety features in a vehicle. The automotive ECU market for Battery Electric Vehicles (BEVs) segment is estimated to grow at the highest rate during the forecast period. BEVs have many electric components and ECUs in the drivetrain, interior, and body. BEV manufacturers are also adopting advanced technologies to attract more customers. Asia Pacific is estimated to dominate the ECU market for automotive, by volume as well as value. The growth of this market can be attributed to the increase in production and demand for passenger cars and electric vehicles. 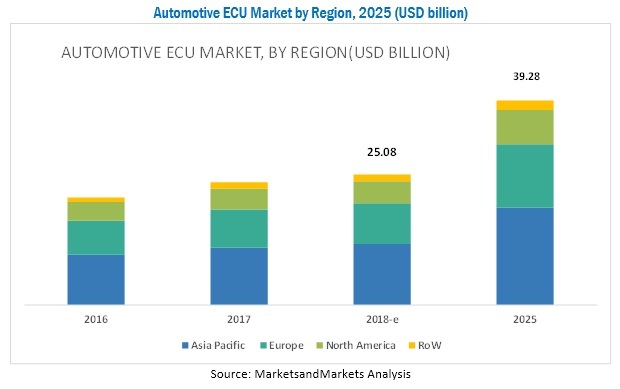 The increasing demand for advanced electronics in vehicles, growing purchasing power of the consumers, and rising consumer awareness for safety features in the developing countries are the key factors driving the automotive ECU market in the Asia Pacific region. A key factor restraining the growth of the automotive ECU market is the increasing consumer preference for BYOD (Bring Your Own Device) and the approach of ECU consolidation. Unlike conventional cockpit electronics system, the BYOD technology eliminates the need for embedded display and infotainment systems in the vehicle. It also indirectly reduces the use of ECUs, which are required to run these technologies. In addition, OEMs are adopting BYOD technology as it is easy to use and helps to cut down the overall cost of the vehicle. Some of the key market players are Continental (Germany), Bosch (Germany), Aptiv (UK), Denso (Japan), Autoliv (Sweden), Mitsubishi Electric (Japan), and Hitachi (Japan).